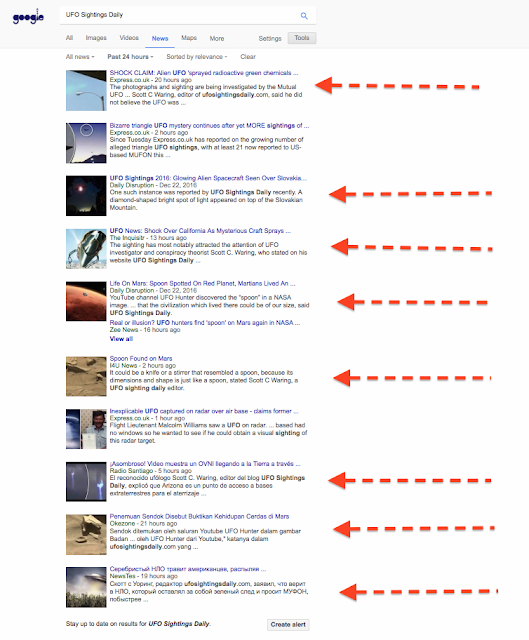 UFO SIGHTINGS DAILY: Thanks guys for making UFO Sightings Daily a world famous site. Dec 22, 2016. UFO Sightings News. Thanks guys for making UFO Sightings Daily a world famous site. Dec 22, 2016. UFO Sightings News. In the last 24 hours, UFO Sightings Daily is in over 8 countries, I actually saw 10 earlier this morning, but didn't take a screenshot till now. Very awesome, so many places, in so many languages...all talking about the existence of aliens because of us. This has always been my goal here...something others have told me almost daily that was impossible to accomplish. My goal, is to raise humanities level of awareness of the things around them. I have already achieved that long ago, but its increasing daily. Aliens are all around us, on Earth, in famous resorts, in underground bases, and some even profiting in business from their higher intelligence levels to make a comfortable lifestyle. We as a race (human race) one day will have our governments tell us that aliens are wanting to meet humanity finally. Sadly, many will go on waiting for this announcement, but I cannot wait. We all need to contribute in some way to this cause, maybe by sharing this info on social media sites, or by scanning the sky daily, scanning NASA/ESA photos daily and reporting what you find. The world is much different today that it was 30 years ago. Its easier now more than ever for a single person to make a difference. But the key is to only report the truth...no lies, no fakes, no deceit. The truth is so much more amazing than all those.